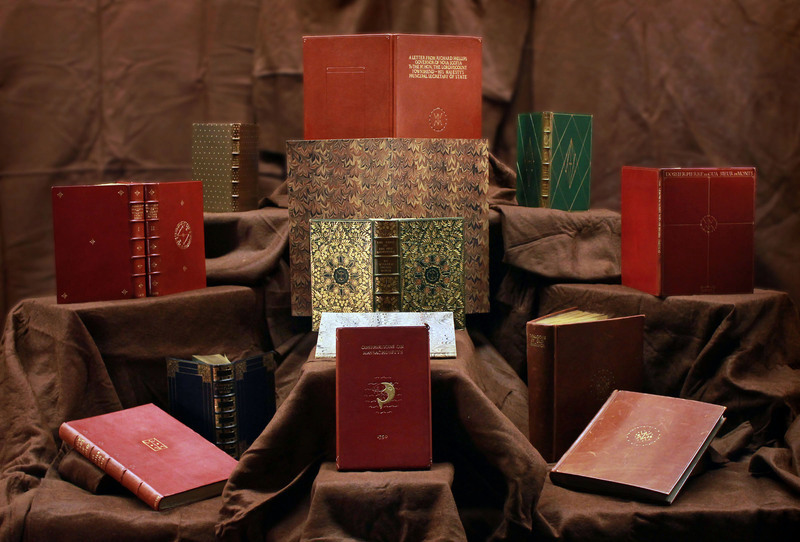 The following is a brief overview of each of the fine bindings in this digital exhibit (navigate to each Cockerell bound volume by using the menu on the right). In full medium-green morocco leather binding, the covers of this volume are ornamented with a geometric pattern composed of single gilt fillets and red dot inlays. The spine features raised bands and gilded text in two compartments. The remaining four spine compartments are decorated with gilt dots, single gilt fillet borders, and triangular gilt fillet. Green silk head- and tailbands trim the head and foot of the spine. Blind-stamped on the back cover turn-in is “D.C. & SON 1931." The front and back endpapers feature the distinctive Cockerell marbled paper pattern. Bound in full dark blue morocco leather, both covers are outlined in double gilt fillets, gilt leaves, gouges, and dots, with gilt flower ornamentation in each corner angle. The spine features raised bands and gilded text, with additional gilt leaves and dots decorating the spine. Leather turn-ins showcase elaborate gilt tooling repeated from the cover design. Endpapers employ green-grey printed papers. An oval shaped blind stamp "WHS" is located on the back inside cover and a small printed label with "The Knole Guild (Misses Speall)" is in the inside front cover. Covered in book cloth dyed with Cockerell's marbled pattern, this volume’s text is comprised of heavy paper sheets hand-sewn onto endpapers of the same heavy paper stock. Including fourteen photographs, this volume contains a catalogue of Cockerell’s descriptions of fine bindings done by Cockerell for three titles. Of special interest are the descriptions of the unique bindings designed for William Morse's, The Land of the New Adventure. Manuscript notes by Cockerell are located to the right of or beneath the images. Morse bookplates and labels are affixed to the inside cover and on the front and back flyleaves. Two volumes of a catalogue for a book collection compiled by Cockerell and purchased by William Inglis Morse are bound in full medium brown morocco leather. The volumes are adorned with a central motif featuring William Inglis Morse's monograph "WIM", created from blind and gilt fillets, gilt dots, and alternating leaves in blind. The title is gilded on the spine and leather turn-ins are outlined in single blind fillets. End papers employ the distinctive Cockerell marbled pattern and “D.C. & SON 1936” is blind stamped on the back cover turn-in. This volume, bound in full red morocco leather features an upper title panel with the title in gilded, uppercase evenly-spaced type. The title is repeated on the spine. William Inglis Morse’s monogram is centred on the front cover, composed of single gilt fillets and circled by a series of gilded dots. Enclosing the publication date stamped on the front cover is a box formed by single gilt fillets and dots. “D.C. & SON 1935” is blind stamped on the back cover turn-in, and endpapers feature the distinctive Cockerell marbled paper pattern. In full brown morocco leather binding, this volume’s front cover is decorated with a central monogram motif created from single gilt fillets and a flower tool. The spine features raised bands and gilded text. The top edge is trimmed and gilded. The fore-edge and bottom edges are untrimmed. The spine's raised bands are outlined with blind stamped fillets. “D.C. & SON 1930” is blind stamped on the back cover turn-in, and the front and back endpapers display the distinctive Cockerell marbled paper pattern. The most elaborate full cover decorated volume in the Dalhousie Cockerell Fine Binding Collection, this volume showcases all of Douglas Cockerell 's most famous design techniques. Every centimeter is covered with complex floral patterns within intersecting geometrical shapes all rendered in gilt. The author's monograph "WIM" is cleverly incorporated into the complicated cover pattern. The visually appealing binding also features a very skillfully crafted map pocket. Striking red leather inlays on the rich green morocco leather enhance the pattern. This volume is bound in medium-brown full morocco leather, stamped with the single gilt star tool on front and back covers, with broken blind fillets along edges of both covers. Gilded text on the spine indicates title of the volume, the author’s name, and the year of publication; blind-stamped on the back cover turn-in is “D.C. & SON 1933.” Green silk head and tail bands trim the head and foot of the spine. Front and back endpapers feature the distinctive Cockerell marbled paper pattern. In full brown morocco leather, the covers feature blind tool single fillet bordering with gild dots in each corner. The title is gilded at the top of the front cover in uppercase lettering, and William Inglis Morse’s monogram is visible in the centre. The subtitle is stamped in gilt uppercase lettering at the bottom of the front cover, while the back cover features a blind stamped vertical rectangle. “D.C. & SON 1934” is blind stamped on the back cover turn-in, and the front and back endpapers display the distinctive Cockerell marbled paper pattern. Bound in full red morocco leather over heavy boards, the front panel features a gilt codfish detail within wavy gilt lines. William Inglis Morse’s monogram is gilded and partially encircled by the fish’s body. The title is gilded and centred above the codfish motif, with the year of publication centred below. The rounded spine includes the title in gild, the Morse monograph in gild at the head and tail and blind fillets at the head and tail. The inner folder features cloth-covered boards lined with white felt, and the spine panel of the folder includes metal eyelets at the head and tail with a leather pull at head of spine held in place by the top eyelet.